Brooks Koepka looks back at the rock-moving incident from the second round of the Saudi International. Brooks Koepka may appear to be one of the strongest golfers on the circuit, but the world No 2 needed some physical assistance during the Saudi International. Report and highlights from the second round of the Saudi International. The three-time major champion was one-under-par with four holes to play of his second round at the Royal Greens Golf and Country Club when he got into difficulty at the par-five 15th. Koepka sprayed his tee shot left of the fairway and into a bunker, with the American's ball lodged next to a large rock that was blocking any swing for a second shot. 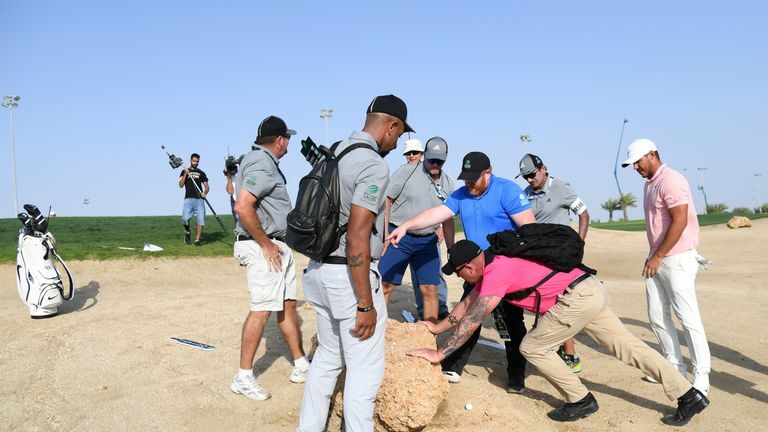 With the rock counting as a "loose impediment" and allowed to be moved, but far too heavy to lift alone, Koepka called upon several nearby staff and spectators to try and get the object out of the way. The rock was eventually pushed to one side to allow Koepka to play his next shot, where he missed the green and then failed to get up-and-down to save par. Click on the video above to see Koepka's rock-moving incident! Watch the Saudi International throughout the weekend live on Sky Sports. Live coverage continues from 9.30am on Sky Sports Golf and Sky Sports Main Event.